Onions? Tears?…No more with this simple kitchen tip! 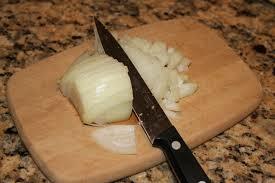 I use onions a lot in my kitchen but stinging tears rolling down my face while I chop my onions? I hate it! I have tried many tricks to avoid this uncomfortable phenomenon including wearing swimming goggles during my chopping (that’s attractive) but recently I heard about a new trick and what do you know? It works! Try these little tips and you may find a bit more happiness with your time with the onion!